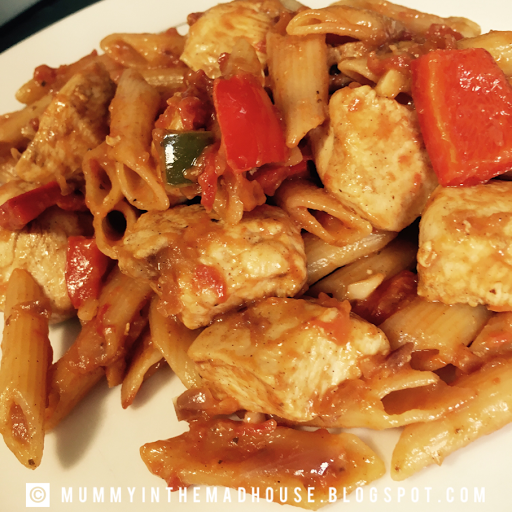 This Chicken Fajita Pasta is hands down one of my family's favourite go to meal when we can't think of what we fancy & when quite frankly I'm in a 'Can't be bothered to cook' kind of mood. It's loaded with crispy chicken, fresh veggies & wonderfully spicy, Creamy sauce. It's mouthwatering delicious. You seriously won't believe how ridiculously quick & easy it is to make! With about 10 minutes prep time & under 30 minutes cooking time.. this makes a perfect midweek dinner. 1x Can Chicken Broth or Chicken Stock made up with 450ml boiling water. Season the diced chicken with half of the packet of seasoning. In a skillet heat 1tbsp of oil over a high heat. When the oil is very hot, add the chicken in a single layer & cook without stirring until one side is seared & browned, flip the chicken over & do the same with that side. Once cooked remove the chicken to a plate & set aside. Add the remaining 1tbsp of oil into the skillet still on a high heat. Add the onions, peppers & remaining seasoning, cook stirring occasionally, until the veggies are slightly blackened. Turn to a low heat & add the garlic, stir until fragrant & well combined, about 30 secs. Remove the veggies to the plate with the chicken. In the same skillet, add the broth/stock, cream, diced tomatoes, uncooked pasta & salt. Stir to combine & bring to the boil, then cover, reduce the heat to medium-low & cook for about 15 minutes until pasta is tender & liquid is mostly absorbed. Add the chicken & veggies back into the skillet & stir to combine & heated through, about 2 minutes. 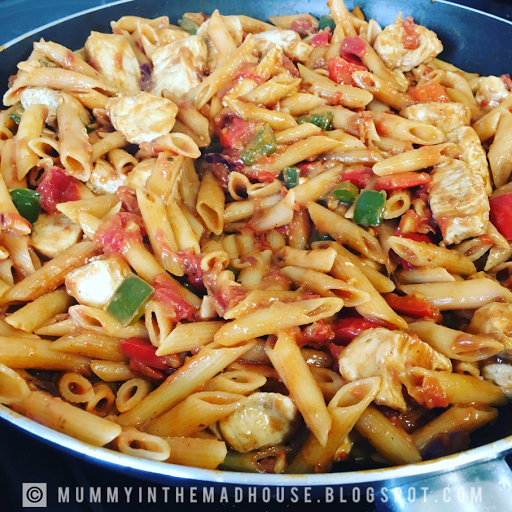 This pasta is PACKED with so many fresh flavours. It would be perfect with a slice of buttery, toasted garlic bread. I hope you love it just as much as we do!